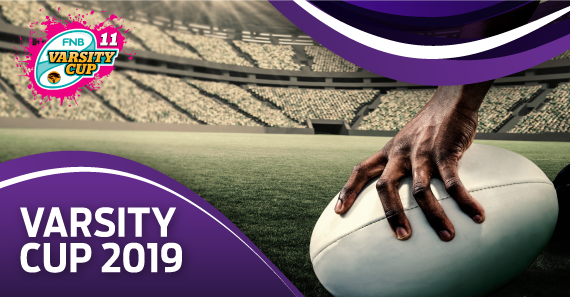 The 2019 Varsity Cup will enter its second round, with four fixtures set to take place on Monday the 11th of February. The opening round of the Varsity Cup may not have produced a number of massive scorelines but it did produce some hardfought affairs with the most breathtaking of the clashes seeing Ikeys beat UWC 32-24 in the Cape Town derby. The other Cape Town based side, Maties, managed to get their campaign off to a solid start as they beat a spirited Wits team 33-17 down in Stellenbosch. Elsewhere, UJ were beaten 8-23 by NWU, while Tuks beat CUT 23-6 in Pretoria. Round 2 of the 2019 edition of the tournament should be an absolute belter with a Cape derby between Ikeys and Maties rounding off the day's four-game fixture list. Monday's early kick-off will mark the start of Shimlas' 2019 campaign. The men from the Free State had somewhat of an underwhelming season last year as their talented squad missed out of the semi-finals by a point. They have a much changed squad this term with a lot of their stars from last year's campaign now involved with the Cheetahs senior squads. New boys on the block, UWC, got their return to the top tier of South African Varsity rugby off to a competitive start as they ran local rivals Ikeys close in Cape Town. Despite putting in a solid shift at against their rivals, UWC were unable to claim a losing bonus point from the game as they went down 32-24. I'm expeting a lot from the hosts here as they were very competitive in their opener. Shimlas also look a rather untested unit at this level and I can see them taking a couple of weeks to get into the swing of things. Next up we have the first of the day's derbies with UJ playing host to Tuks in a trans-Jukskei clash. The hosts had a tough start to their season last week as they hosted 2018 beaten finalists NWU, who were far to good for them as the visitors ran out 8-23 victors. Tuks got their campaign off to a far more positive start as the lads from Pretoria registered a 23-6 win over CUT. This was just the start that fans of the Varsity would have been hoping for after last season's dire showing that saw them end the campaign in seventh place. Last season's clash between the two sides ended in a 30-30 draw. While this year is unlikely to produce another draw, we should still see a very tight scoreline here. Wits will be looking to build on their hardfought away defeat to Maties when they return home to take on a limited CUT side. The visitors got their campaign off to a rather limp start as they went down 23-6 away to Tuks. While Wits also experienced a defeat last week, they produced a far better performance down in Stellenbosch where they went down 33-17 to tournament powerhouse Maties. The 'Witsies' fancy their chances of registering their first win this term as they beat CUT 18-52 last season. The men from Johannesburg have a solid squad who should have no troubles getting one over CUT this Monday. The final Round 2 fixture will see local rivals Ikeys and Maties square off at the UCT Rugby Fields. This used to be the premiere clash when the Varsity Cup started but over the years Ikeys have declined in quality while Maties have become the competition's giants. There were signs of life from Ikeys last season as they improved greatly, missing out on the semi-final places by just four points. They also managed to get their 2019 campaign off on the right footing as they beat local rivals UWC 32-24 in a testing affair. Maties, as we've become accustomed to in recent years, got another season of Varsity Cup rugby off to a flying start as they beat a spirited Wits side 33-17. The men from Stellenbosch look the real deal again this year, and I can see them following up on last week's victory with a win in excess of 17 points here.